Just before 5pm Thursday Co. 50 was dispatched to assist Co. 46 and the State Police in the search for a missing person in the area of W Forge Rd. Co. 50 responded with Tac 50, ATV50, Squad 50, and Utility 50. Units assembled on Forge Rd in the staging area and were returned a short time later. While units were returning from the search Utility 17 discovered a motor vehicle accident on Baltimore Pike in the area of Pennell Rd. Crews from 50 went in service with hydraulic rescue tools to extricate one patient. Co.’s 46, 17, 50 assisted in extrication and removal of hazards. 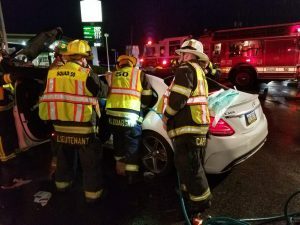 Tac 50 was dispatched to assist the paramedics with an unconscious person in the 300-blk of Mount Alverno Rd while the other units from Station 50 were in service at the accident with entrapment. 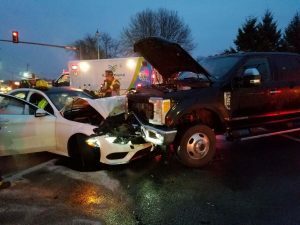 As units were clearing the accident with entrapment and the medical assist, the company was dispatched for another accident on Baltimore Pike in the area of the clover leaf. Chief 46 arrived to find a minor accident with no injuries and returned the assignment. Station 50 responded to the concurrent incidents with 20 personnel on Squad 50, Engine 50, Tac 50, Utility 50, and Command 50.